You will not believe if I tell you that Lotus seed is more beneficial than lotus the flower. Yes, it is true and in this article, we will look how consumption of lotus seeds helps for healthy skin, hair and also for good health. These seeds have a sedative effect and hence can greatly help for related elderly. These Seeds are green in color when fresh and tend to turn cream or yellow color when dried. Lotus seeds can either be eaten raw in fresh or in dried form. The dried lotus seeds are easily available compared to the fresh seeds. The major nutrients present in these seeds are fats, proteins, some useful starches, iron, calcium, zinc, and magnesium. These amazing seeds are considered beneficial for heart problems and they also provide a refreshing and calming effect to your body. They are useful for detoxification of the spleen and also improve the appetite. Lotus seed consumption has proven very useful to improve memory and brain function. These seeds taste bitter but have the best effect on the human heart. You can enjoy having them raw or cooked all according to your wish. Easy availability and great medicinal use make them one of the healthiest snacks. Phosphorus, protein, potassium and magnesium are some of the important elements of healthy nutrition. These seeds also contain zinc and iron. We are claiming their health benefits because low levels of cholesterol sugar, sodium, and saturated fat are present in these seeds. These nutrition benefits make Lotus seeds a popular healthy food. Lotus seeds are a powerful tonic for your kidneys too. These seeds contain an astringent formula which helps to return vital energy and regulates the proper working of the kidneys. According to different traditional therapies especially in the Chinese medicine, you can notice wide application of lotus seeds for the treatment of different ailments. Lotus seeds and its sweet taste is beneficial to treat diarrhea and spleen related disorders. Chinese medicine recommends consumption of these seeds to reduce the problem of diarrhea. One can also consume them to increase the spleen health. Studies have suggested that lotus seeds help to strengthen the digestive system of the body and reduce diarrhea. Insomnia is one such sleeping disorder which affects a lot of people. The crazy lifestyle and work pressure are one of the reasons behind such disorders. If you are facing the same issues then these seeds are the perfect remedy to cure such disorders. Lotus seeds have calming properties and are best to treat insomnia or restlessness. Lotus seeds have been traditionally used to cure people who are having sleeping disorders and alleviating restlessness. These seeds have calming effects and are a natural sedative. High blood pressure and problems related to it can be easily prevented simply with the consumption of lotus seeds. The embryo inside the lotus seed, have bitter and cooling properties which are required for a sound heart. The bitter one due to isoquinoline alkaloids which claims to have calming effects and are antispasmodic in nature. Antispasmodics can help to the dilate blood vessels and reduce the blood pressure of human body. You may add lotus seeds with other ingredients to cure urinary disorders like prostatitis and other reproductive conditions. Sexual illness is one of the common problems due to uneasy lifestyle. You can cure sexual illness by consuming lotus seeds it is not us who are claiming this as the studies have shown the results. According to a researcher, the lotus seeds can also be used to heal the sexual problem. These seeds play an important role during healthy the sperm formation among men. These seeds are beneficial to human health as they have antispasmodic and calming effects. This means it can make relax your nerves for a sound sleep. Due to the presence of isoquinoline alkaloids in lotus seeds, they also help in the process dilatation of blood vessels and helps rejuvenated. It has been proved through a study that Lotus seeds contain certain properties which are very helpful in the process of cooling of heart and also provides necessary relief from the pathogenic heat. The health benefits of lotus seeds are not limited to digestive and cardiac health only. These seeds are equally beneficial for oral care too. It is recommended to take lotus seeds if you are suffering from unhealthy gum tissue because of the healing properties of these seeds. Lotus seed contains magnesium which is well known to improve the blood circulation and oxygen. Magnesium deficiency can be a reason behind heart-related disease and hence you should not avoid it. The risks of a coronary heart can be avoided easily with folate and magnesium. Losing weight is not difficult at all as you just need to control your habits of overeating. Lotus seeds are known for having a low of glycemic index (GI). The consumption of lotus seeds provides you a feeling of being full and you will stop eating unnecessarily. Skin is the largest organ of your body and equally important when compared to other organs present in your body. 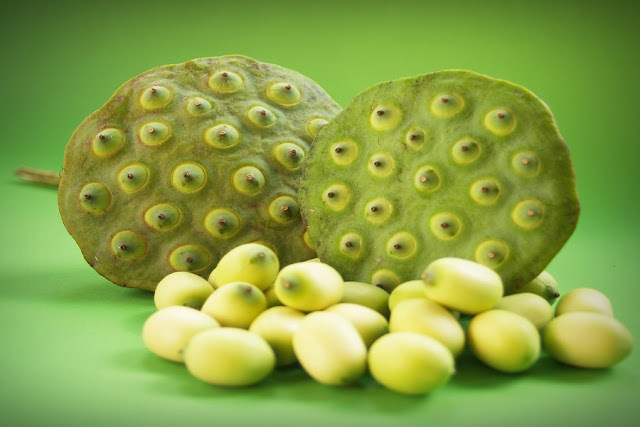 The lotus seed provides the necessary moisture and hydrates your skin. This property of lotus seeds help to improve skin elasticity and with the skin complexion. Lotus seeds are an important ingredient many skin care products and treatments as it contains skin friendly properties. Its application stimulates an instant skin hydration. If you are experiencing flaky and dry skin you can use this ingredient to have an envy skin. The lotus seeds are good for fading wrinkles and spots. Lotus seed contains L-isoaspartyl methyltransferase. This enzyme is responsible for the ant-aging properties as it helps to repair crushed proteins. These enzymes avoid aging of the skin and further assists to repair and maintenance of the damaged proteins. Studies have shown that lotus seeds contain kaempferol which is a natural flavonoid. This flavonoid prevents inflammation and helps to fix aging tissue. Many conditioners and hair products contain Lotus seeds extracts. Application of such hair products conditioner offers you relief from split ends and naturally shiny hair. To increase the elasticity, volume and strength of the brittle hair Lotus seeds are highly recommended. Try lotus essential oil to prevent Premature Graying of Hair. According to the studies, the Lotus oil stimulates melanin synthesis in gray hair. Lotus seeds are equally important as the lotus flower and its roots. These seeds are loaded with certain chemical compounds which are necessary for human health, skin, and hair. Using them in a prescribed manner is always beneficial.